The advancement of miniaturization technology has resulted in many things becoming far smaller without sacrificing on performance – and the same can be said of the projector. Even until now, projectors are still rather bulky in size, but then again they certainly have shed plenty of weight over the years, and at least you need not wait until the bulb cools down completely before turning off the main power in select models. What happens when you take a shrinking ray and point it towards a projector? Why, you end up with the Dell M110 Ultra Mobile Projector, of course! 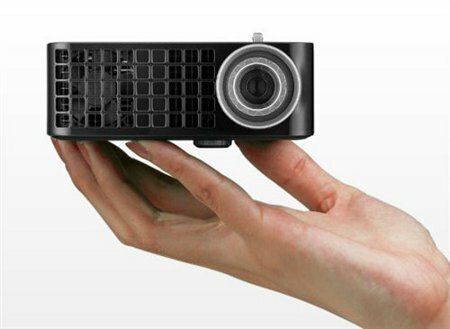 The Dell M110 Ultra Mobile Projector is said to be more than just a projector, as it is a truly portable media hub that can see action either at home or at the office. It will tip the scales at a mere 0.8lbs, but despite the relatively small size, do not be deceived by its super small package – the M110 is still able to pack a punch! Connectivity options are aplenty – you get VGA, HDMI and USB inputs, allowing you to present your fair share of multimedia slideshows as well as run audio-visual applications directly from your digital camera, DVD or DVR player, video game console, and perhaps select mobile devices – without having to own a computer or a notebook. Want to take the wireless route? That is not a problem, just add the optional wireless dongle and you are good to go. The 1GB of internal memory might not sound like much, but it can definitely be augmented to 32GB thanks to the presence of a microSD memory card slot. As for audio, I would assume the traditional weakness of projectors (portable or otherwise) will remain – that is, the integrated 1W speaker would not amount to much – perhaps it is good enough for sit-in movies, but other than that, you might want to hook it up to an external speaker system. Dell claims that the M110 is good enough to work in a brightly lighted room (with ambient lighting), where the mercury-free LED technology used inside the M110 projector can deliver up to 20,000 hours of service sans a LED lamp or bulb replacement. Will the Nook Tablet end a possible “Reign of Kindle Fire”?